EastEnders Spoilers: Who Will Go Down For Ray’s Murder, Hunter Spirals And Mel Panics – The Pressure Is On! 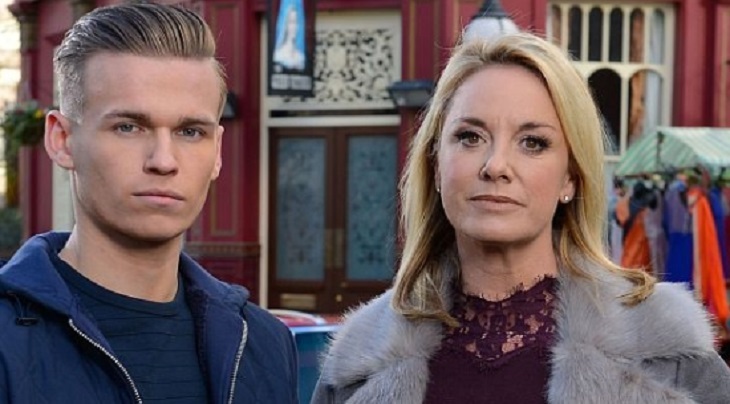 Coming up next on “EastEnders,” as Hunter opens up to her mom, telling her about his fears that their secret might be exposed, the dreaded knock on their door came. Ray’s former wives are back and demanding answers from Mel regarding Ray’s whereabouts. Mel and Hunter’s secret was almost exposed in the soap’s previous episode. Viewers may recall that Hunter Owen shot his stepfather Ray Kelly in the woodlands. It all started when Ray kidnapped Hunter to lure Mel into the woods. She managed to take control of the situation when she pointed a gun at Ray and demanded the release of her son, Hunter. She freed up the injured Hunter, and they both got in the car and tried to flee. As Ray tried to smash the car’s windows, Mel reversed the car into Ray. They both thought he was dead and buried him in the woods. But to their surprise, the maniac Ray was still alive and tried to strangle Mel. Hunter saved his mother by shooting Ray, which sent him off to his death. After three weeks of cooling off following the death of Ray on EastEnders, Mel and Hunter came back to Walford. Hunter assures his mother that he is fine but his actions say otherwise. Hunter and Keanu gets into a fight because of Louise Mitchell. Hunter is out for blood after the incident. He takes the gun he used to kill Ray and plans to kill Keanu with it. Luckily, Louise shows up in the alley where Hunter lured Keanu to shoot him, thus saving his life in the process. Hunter goes out of control and starts to stir up trouble in E20. Jack Branning sees him and brings him home to Mel. Hunter then confesses to his mom, saying, “I lied to you. I lied to you, I’m just waiting for that knock at the door!” But as Mel tries to console her guilt-stricken son, Ray’s former wives show up. Will they finally expose what Mel and Hunter did to Ray? Or will the mother and son come up with a good excuse?